A Dornier bomber flies over London in one of hundreds of raids the Germans mounted against the British capital, as well as towns and airfields across England during the Second World War. Seventy-five years ago, on July 9, 1943, a Dornier Do 217E became separated from the rest of its 10-plane Luftwaffe flight as it entered a cloudbank on its way to bomb London. Likely based near the town of Toulouse, France, close to the Spanish border, the German bombers had crossed the English coast at Hastings on one of hundreds of raids that dropped tens of thousands of tonnes of bombs over the course of the Second World War, killing some 60,000 British civilians and injuring 80,000 more—most of them Londoners. The market town of East Grinstead in West Sussex lay below. Situated about 15 kilometres as the Spitfire flies from RAF Redhill (where my father was based at the time with 401 Squadron, Royal Canadian Air Force), it had always been a potential target for Germans passing overhead. Until this day, however, it had never been touched. It was 5:05 p.m. on a wet and miserable Friday, and the Whitehall Cinema on London Road was unusually full with 184 people watching the B picture, the Hopalong Cassidy western Undercover Man. Many were children. 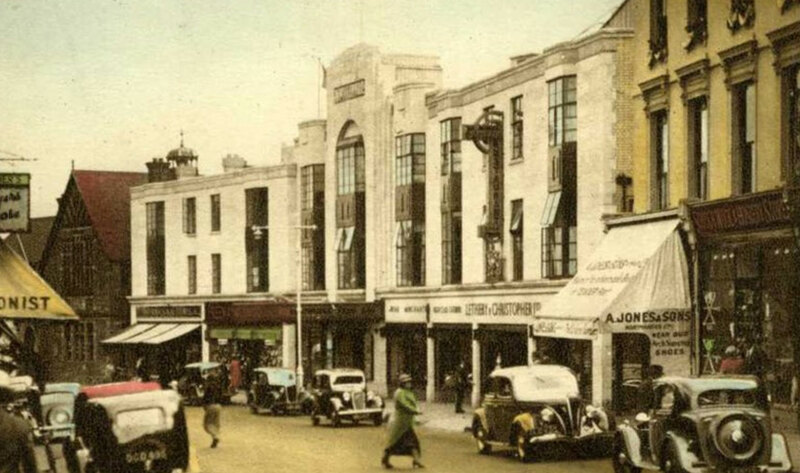 East Grinstead’s Whitehall Theatre on London Road before it was destroyed when a single Dornier bomber attacked the town on July 9, 1943. Most of the 184 theatre-goers ignored the air-raid warnings and continued watching a Hopalong Cassidy film. 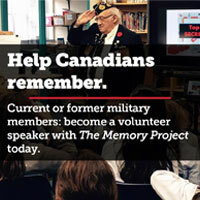 There were dozens of Canadians there too—soldiers, mainly, from a broad cross-section of units and disciplines: signallers, support troops, armoured, infantry, artillery and combat engineers, to name a few. Most of the audience paid little heed as the air-raid sirens sounded and a warning appeared on the screen. They had, after all, encountered alarms many times before. Depending on the specific type and configuration, the Dornier could carry as much as 4,000 kilograms of bombs. Its armament included a manned, forward-firing MG-15 machine gun in the nose. Some were also fitted with a movable 20-millimetre cannon up front along with a fixed 15-millimetre weapon installed in the forward floor, all controlled by the pilot using a firing button on the yoke. By 5:10, the plane with its four-man crew was circling, seeking targets before turning for home. It sighted a train at nearby Lingfield. The pilot dove and strafed it before following the railway south until he found East Grinstead. “After circling twice, the pilot dropped his stick of bombs on London Road and the High Street,” reported the Royal British Legion’s Sussex Roll of Honour website. Some theatre-goers had already begun filing out when two bombs—one 50 kilograms and one 500 kilograms—came crashing through the cinema roof. Most could not. The bombs exploded, destroying the building and burying most of those inside under piles of rubble. Thirteen-year-old John Parsons had gone to the cinema with a friend after school. “We saw the news[reel] and while a cowboy film was showing, the bombs fell,” he said in an interview shortly after the attack. “I was sitting in the front row—in the ‘tenpennies.’ The first thing I knew was a sort of crackling which ran along the ceiling. The exit lights and the film went out at the same moment and the place was in complete darkness. Sainsbury’s, between Bridgeland’s and the cinema, collapsed. 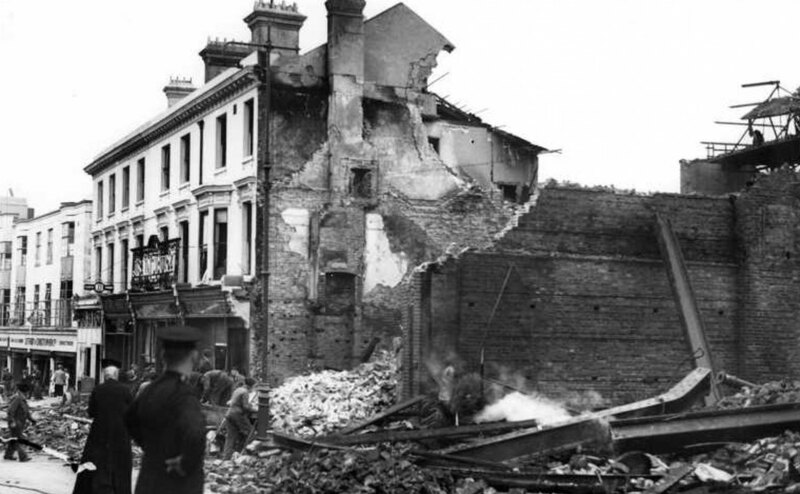 A 50-kilogram bomb exploded by the Wesleyan Church Hall on London Road. The Warwick Arms pub, where some Canadians were hoisting a few, was also hit. Another bomb hit the Brooker Brothers shop and four 50-kilogram bombs hit a stationer’s shop, Tooth’s. Two other 50-kilogram bombs landed but didn’t explode. Townspeople view the rubble in East Grinstead after the 1943 attack by a single German bomber; 108 people were killed, including nearly two dozen Canadians, and another 235 injured. The Dornier then wheeled around and strafed London Road, the railway approach and a train approaching the station. Norman Henry Arnold had recently left school and was working at a railway signal box at Three Bridges, about 10 kilometres away. He was in the Whitehall Cinema during the bombing, but escaped without serious injury. “He was making his way…to the railway station when he was hit twice in the back when the bomber returned to machine-gun the town, dying soon after,” said the website. Eleven-year-old Michael John Brackpool’s father Herbert was working in the cinema’s basement bakery when the ceiling split open and four female casualties fell through. His son’s body was later found in the theatre rubble by a co-worker. Eighty died in the theatre, including 13 children. Some 50 more were badly injured. Carol Ann McCollum may have been the youngest victim. She was two or three. Her father Edmund was a private in the Royal Army Medical Corps. Police, Home Guard and civil-defence workers rushed to the scene, along with troops based nearby, many of them Canadians. In their book Secret East Grinstead, authors Dorothy Hatswell and Simon Kerr describe how Joe Meadmore was leading one of the permanent rescue parties that had been formed by the local council just two months before the attack. “Meadmore was about to go off duty, just after 5 o’clock, when he heard the explosions,” they wrote. “The telephone rang to tell him that the Whitehall had received a direct hit. “On arrival at the cinema, they saw the devastation with horror. A tangled mass of girders and rubble met their eyes…. Meadmore sent for reinforcements and then continued to rescue as many people as he could. In a strange twist, it was Roberts who informed Meadmore that his wife had been killed at the Bridgeland’s shop a few doors away. She had just started working there as a cashier that week. Among the Canadians killed was Lance-Corporal George Dale Burgess of 3 Provost Company, who died five days later from wounds he sustained in the attack. He was from Toronto, and his father, Lance-Corporal Charles Dykes Burgess, had been killed in 1916 while serving with the 18th Battalion (Western Ontario Regiment) on the Western Front. Charles Burgess’s body was never found and his name appears on the Vimy Memorial. Robert Wesley Harcourt, a captain in the Royal Canadian Horse Artillery, was killed along with his English wife Ethne at the Whitehall Cinema. At least 108 people died in the attack, including nearly two dozen Canadians. Another 235 were injured, most of them seriously. 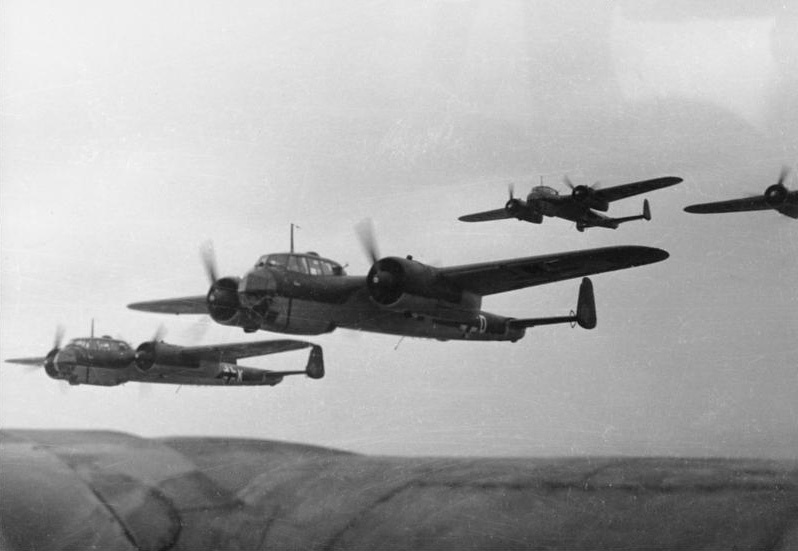 The last survivor was rescued at 7:10 p.m.
A formation of early-version Dorniers flying in 1940. The plane was to become a standard in the Luftwaffe arsenal. 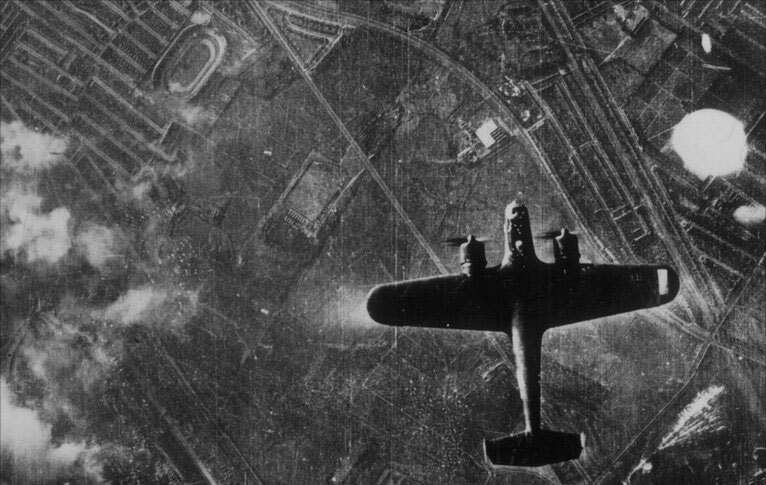 Although the countryside around the south of England was dotted with grass-field air bases, the Dornier was shot down by anti-aircraft fire. My father, an air force doctor, was dispatched to the crash site near Bletchingly, about five kilometres from 401’s base at Redhill. There were no survivors. All his life, my dad spoke bitterly of the incident and the children’s deaths. As much as the deaths of all the pilots and others he knew, I am sure it shaped his postwar life immeasurably. He admired the Germans for their precision and workmanship, but he never understood how a people could so blindly follow a madman like Hitler. Most of his views would mellow over the decades but, as much as he loved cars, he never drove a German car and he made my 16-year-old brother return the first automobile he bought, a used Volkswagen Beetle. 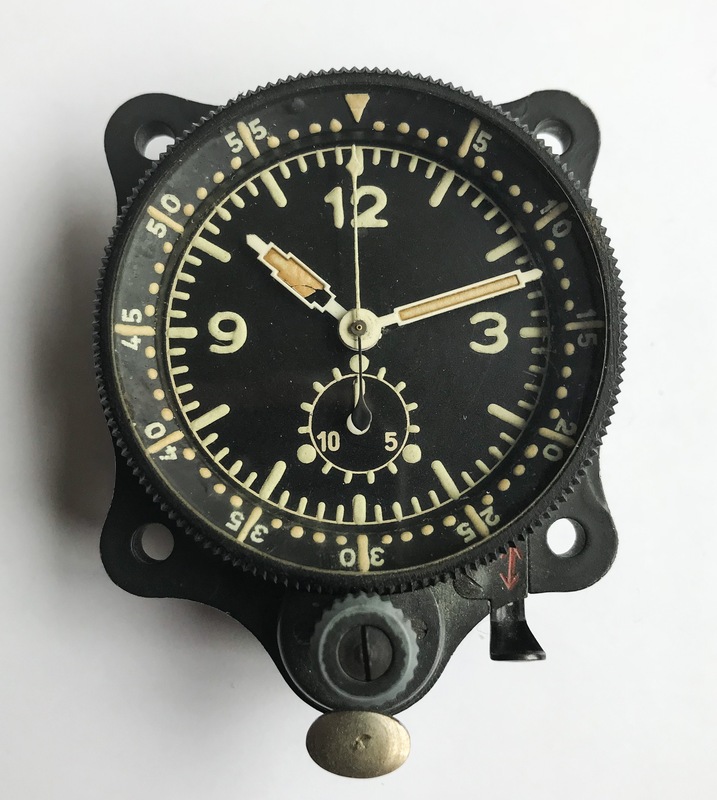 The clock I believe my father recovered from the Dornier that bombed East Grinstead on July 9, 1943. It still works. He took no satisfaction, however, in recovering parts of the Dornier pilot from a tree. I believe it was at this site when he picked up a German Luger pistol, its barrel bent backwards. He considered keeping it—a violation of the rules—but thought better of it and took the plane’s clock instead, which I still have. Information online suggests the aircraft was excavated in the 1970s. The crew was buried in a local cemetery, and later exhumed and repatriated to Germany. Most of the Canadians lie buried at Brookwood Military Cemetery in Woking.